The most common fatal genetic disorder of children for which there is no cure. Affects approximately 1 in every 3,500 live male births (about 20,000 new cases each year). Average life expectancy varies from early teens to late 20s. 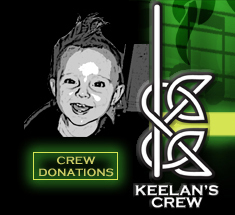 Send a check payable to "Keelan's Crew " to : 13 Moody St., Haverhill, MA 01830. We thank you for all your generosity!